J.W. Dixon owned a profitable cloth-dyeing business in Leeds, England, which provided him with the time and resources to engage in microscopy as a hobby. 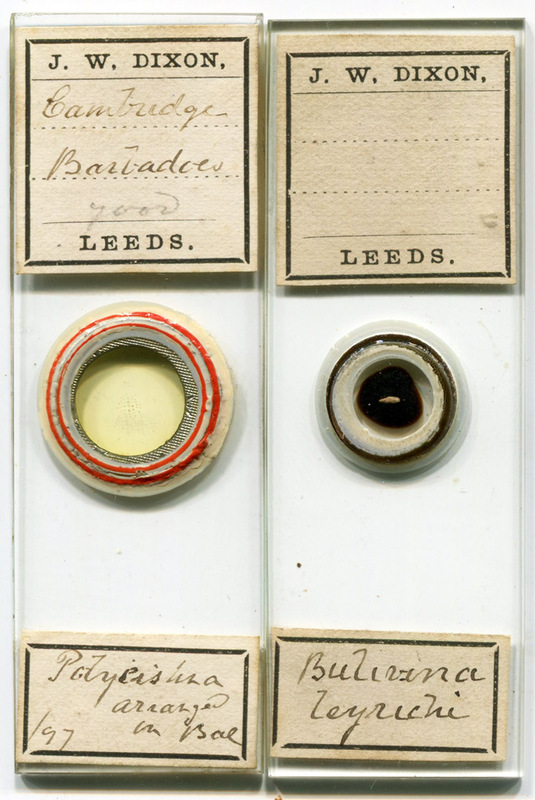 Dixon joined the Leeds Naturalists' Club & Scientific Association in 1872, and regularly presented microscopical objects to that group. He was also a member of the Leeds Philosophical and Literary Society, whose records highlight donations of mounted foraminifera during 1887-88 and 1896-97. Figure 1. Microscope slides by J.W. Dixon. The left slide (see Figure 2) is dated 1897. Dixon donated “a series of microscopical slides of foraminifera” to the Leeds Philosophical and Literary Society during its 1896-97 session. Bracegirdle’s “Microscopical Mounts and Mounters” shows another 1897 Dixon slide of arranged foraminifera as Plate 13-H. 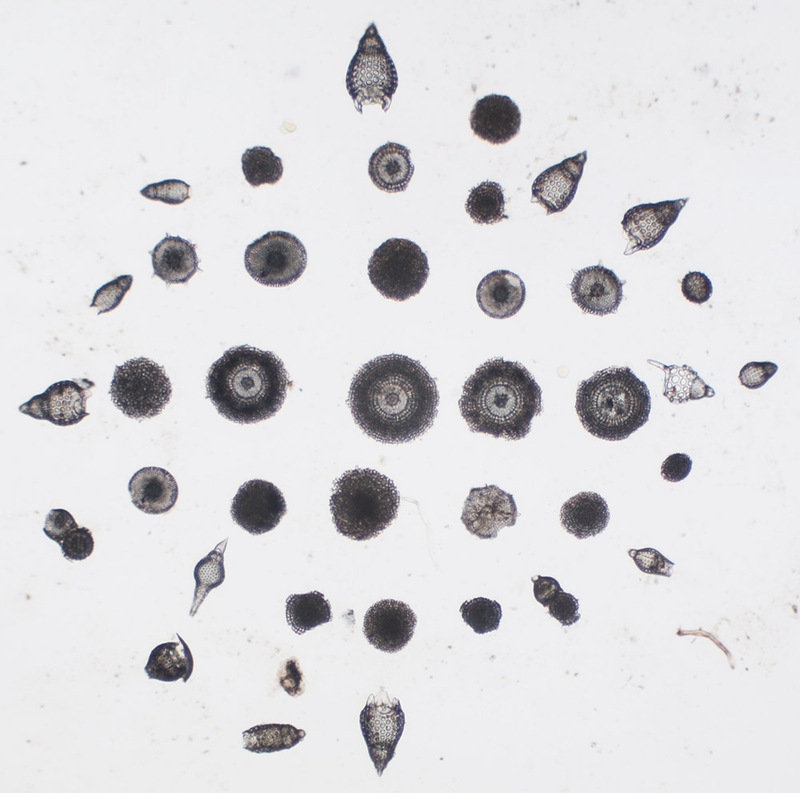 The right slide is a dry-mount of a single Bolivina foraminiferan. Figure 2. Arranged foraminifera from Barbados, by J.W. Dixon, 1897. Figure 3. 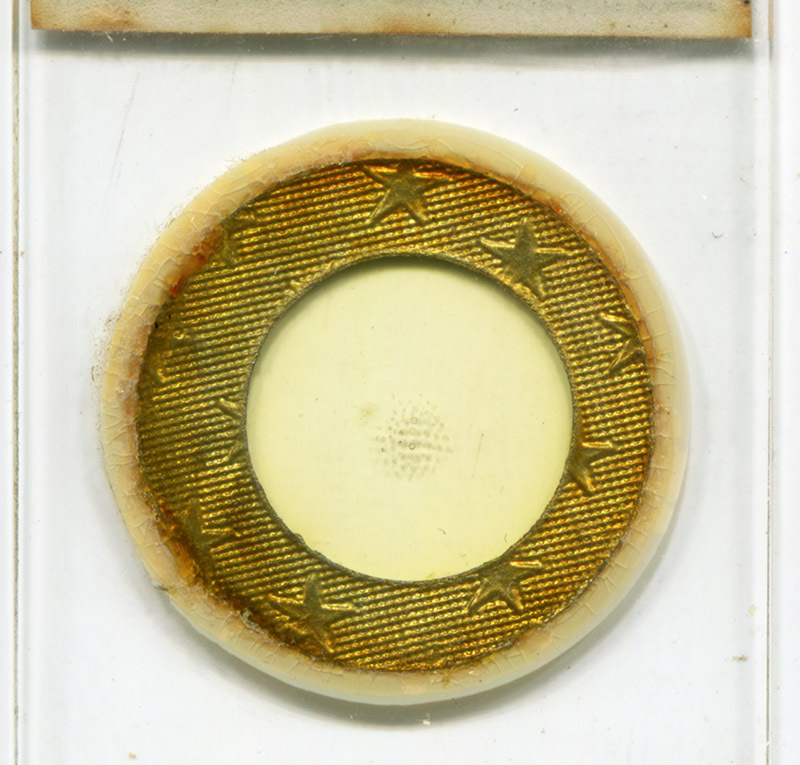 Rear view of the arranged Barbados foraminifera slide, showing the embossed paper circle that Dixon used as a spacer between the slide and coverslip. J.W. Dixon’s father, Henry, started a cloth-dyeing business in Leeds in the early 1800s. John William was the first child of Henry and his wife, Elizabeth, born on May 11, 1835. A sister, Jane, followed in November of 1836. Mother Elizabeth died soon afterward, and both she and Jane were missing from the household at the time of the 1841 census. Henry remarried to a woman named Martha around 1841. Henry had at least three children with Martha, the eldest of whom, Robert, later became a business partner with J.W. and their father. That partnership probably began around 1860. John married Susannah Croisdale late that year, implying that he had become financially independent. The 1861 census, conducted in March, recorded John, Susannah, and a domestic servant as living apart from their parents. The partnership between John, father Henry, and brother Robert ended in January, 1867, with John and Robert continuing the cloth-dyeing business as “Henry Dixon and Sons”. The 1871 and 1881 censuses listed John as a “Master Dyer”, employing upwards of 21 men. J.W. Dixon joined the Leeds Naturalists' Club and Scientific Association on June 18, 1872. He also became a member of the Leeds Philosophical and Literary Society. Reports of both societies indicate that Dixon was an active member until at least the turn of the century. Special notice was made of his donations of mounted foraminifera to the Philosophical and Literary Society during its 1887-88 and 1896-97 sessions. Dixon’s business was such a financial success that he had retired from work by the time he was 55, according to the 1891 census. He and his family continued to enjoy the luxury of a domestic servant. John W. Dixon died in Leeds during the autumn of 1919.